The place to begin thinking about feeding an older person is with them and their individual nature. Whether you have a frail relative who is not coping with the demands of daily life and needs food provision, or a usually sprightly elder who’s just unable to cook temporarily, perhaps through an injury or illness, they still have rights, needs and desires. Rights - Older people have a right to dignity, sensitivity and to good tasty food, their needs are for care and affection and nutrition suitable to their age and health and their desires help you provide for their rights and needs. Rights to dignity may include not forcing change on older people – you may not approve of their food choices and preferences, but they have lived a lifetime with them and changing their meals or where and how they eat can make them feel disempowered and unhappy. They also have the right to cheat on their diet from time to time, just as you do! Needs Older people's needs are often ignored – everybody, for example, needs to want to eat, so perhaps your elder needs to take some light exercise such as a walk to the shops, a stroll round the garden or a visit to a friend – such simple techniques can speed the metabolism and make a senior citizen want to eat more, as well as making their digestive system work more easily. They may also ‘need’ to eat more formally, with a tablecloth and table mat, and lots of cutlery – don’t criticise this, it’s how they were brought up and anything less feels sloppy to them. Desires are vital to ensuring you get catering for an older person right. Begin by making a list of that person’s food preferences, their medicines and what you have been told by health professionals are their needs. If you have an anaemic relative who hates liver, for example, you can give them extra green vegetables along with vitamin C rich fruit to boost their iron intake. If your elderly father loves roast dinners but has high cholesterol, you can give him foil roasted meat, which has less fat than pan roasted, and mash, or dry roasted potatoes. Always keep rights, needs and desires in mind as you prepare meals or buy groceries for the older person. When serving such foods make sure they are kept properly chilled, that they aren’t left sitting around on the plate while the older person does something else and forgets to eat, and that they aren’t refrigerated to be ‘finished off later’. Dispose of leftovers in the bin. Also remember that as older people don’t produce as much saliva, they need ample gravies and sauces and casseroles and braised dishes and stewed fruits rather than whole ones will be easier for them to eat as they have a substantial liquid component. 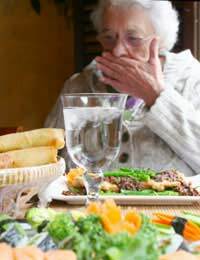 As we get older our tastebuds register less variety - salty and sweet are the first tastes to fade, then sour and bitter – and this means that usual seasoning can leave food for older people tasting bland. This is why the salt cellar is often over-used by our elders! To prevent too much salt use, add more acid elements like onions and lemon, cook with fresh herbs, use wine or mustards to enrich flavours and generally assume that if it tastes right to you, it needs to be stronger for the older person to relish it.